Description: two bnsf units picking up a long line of rolling stock at cochrane. Description: Look to the right, maybe you'll get it lol. 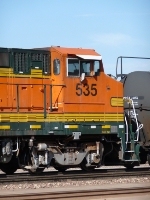 Description: Local power BNSF 535. Description: BNSF 542 is seen leading the B FRSFRS1 23 after picking up its consist of baretables in Shafter. Description: Trailing in the lead power on the eastbound L CAL313 13.